How short can I keep the hedge? Also, some shade and some sun areas. 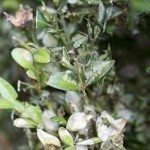 Severe pruning of Boxwood, or keeping them very low can have mixed results. My recommendation would be no shorter then 2 feet.